Every underdog has its day. And Raghu's share of the good life is long overdue him. The roof leaks, his mother screams, he's overworked, underpaid, balled up, kicked at, and generally treated like the lowest little squiggle on the totem pole. But every soul, no matter how harassed, has capacity for beauty. And Raghu's little island of perfect pulchritude floats entirely on a sea of transmission waves. All of Raghu's longing for peace and self-actualization is concentrated in one character from a television soap opera. Through glycerin, plastic and pancake, Neetaji speaks to him of love and life, and he listens in rapt adoration. She understands, she feels his pain, she knows how fake, petty and degenerated people are, and yet, she smiles and explains so it makes sense to him. How wise, beautiful and strong she is. And how typically banal of the world to keep telling him she isn't really real. There's one person, though, who somewhat gets Charlie Brown here. A bar-dancer and prostitute, Sweety is tickled to death by Raghu and his strange ideas of chivalry and honor. But she's concerned about this nut job, and utterly crazy about him. So when Raghu gets kicked out his job at the bar, she sweet-talks one of her prospective customers into employing him. Another little love story transpires in the heart of said prospective customer, Mario. Sweety has this hired goon wrapped firmly around her pinkie, and that's how Raghu comes to be the designated driver during the attempted murder of famous television star, Reshma nee Neetaji. Our repressed romantic finally has a purpose! Raghu must save Neetaji from the murderers, he must run away with her, so nobody can find them, he must do this for the sake of all that is good and pure and true. Following this train of thought and completely sure for once in his life, he knocks his princess out with a chloroform gag (don't ask), throws her over his shoulder and heads off into the unknown. In a stolen jeep. With the cops, Sweety and an enraged Mario behind them. Uh-oh. Of all the dangers Raghu has to face, including a gun-toting killer and one very pissed off princess, the most terrifying and unexpected one is Sweety. How dare he lie to her and carry on with some sniveling little 'actress' of a woman? Raghu is as confused as any member of his gender at this sudden change in the tide of female emotion. They're obviously made for each other, but Raghu's first love still has him in thrall and it's a little too late in the day to change channels. Neetaji is finally rescued and, with a little wave, she's out of his life. Vijay Raaz as Raghu is brilliant. There's no need for any other adjective, because that one about covers it. If they ever bring Hullabaloo In The Guava Orchard to screen, no one would make a better Sampath. Raaz brings Raghu's entire slouching, woebegone personality to life with such stark empathy, it makes you want to cry, but you'll find you're laughing hysterically instead. All other actors are excellent, even the ones that have about five minutes total screen time. Saurabh Shukla as Mario is the master of sublime comedy, and Sadiya Siddiqui fills Sweety's role with her own brand of spit and fire. Even Goretti adds her bit to up the entertainment quotient. Watch this movie. It does everything you imagine the director wanted it to do. It's funny, profound and insane. And it never once takes itself too seriously. Raghu Romeo is the most fun you'll have at the movies this week. Terrific performances. Hilarious plots & execution. Kudos to Rajat Kapoor and the cast! funny, funny! also brilliant. 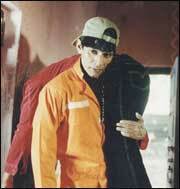 vijay raaz is to be firmly hugged. I was going to say "Ultimate paisa vasool"
fullhyd.com has 700,000+ monthly visits. Tell Hyderabad what you feel about Raghu Romeo!